Crafted from calf leather in a rich navy hue, the KENZO crossbody bag strikes the perfect balance between fashion and function. 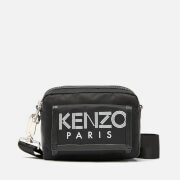 Constructed with a sleek rectangular design featuring a top zip fastening and appliqué leather KENZO PARIS logo to the front. Opens to reveal a fabric-lined interior with single slip pocket for extra storage. Equipped with an adjustable leather shoulder strap. Arrives with a branded dust bag.